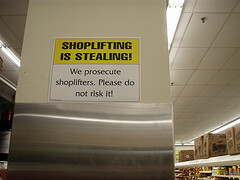 Shoplifting, or retail theft, is prosecuted vigorously in Utah. Many people in Utah have shoplifted at some point in their lives. It may have been a minor incident such as tasting a candy out of the candy bin at a grocery store, or stealing a pack of gum when a person was a small child and did not know any better. Other times, people are adults who know better but for whatever reason take something from a store without paying for it. Sometimes people who shoplift will even take an item from a store when they can afford to purchase the product, but they steal the item for the sole purpose of the rush they receive from their illegal activity. Despite who shoplifts or for what reason the shoplifting occurs, Utah law strictly prohibits the behavior and punishes those who engage in it. Because the law can be harsh towards shoplifters, many people benefit from the services of a Salt Lake City criminal defense lawyer. Under Utah law, shoplifting is formally referred to as retail theft. Retail theft occurs in Utah when a person takes property from a store of any kind with the intention of depriving the merchant of the property, and without paying for the property. A person could also be charged with retail theft if he or she alters a price tag on merchandise in hopes of purchasing the merchandise at a cheaper price than what the store labeled it. Essentially, retail theft occurs whenever a person attempts to take property from a store without paying for it, changing the price of an item, puts an item in a different item’s container, or under-rings (i.e. intentionally forgetting to scan an item a person puts at the bottom of a shopping cart). Finally, it is also considered retail theft when a person removes a shopping cart from the premises of a retail establishment with the intent of depriving the merchant of the possession, use, or benefit of the cart. In addition to criminal penalties such as a fine and having to take a theft class, people who commit retail theft are also subject to civil penalties. This means a retail store can come after a shoplifter for stealing from their store if they sustained any damages. For example, if a TV was stolen from a store, the TV was broken in the process, and the TV was worth $300, the store could sue the shoplifter for $900 as well as the store’s costs to bring the lawsuit and the store’s attorney fees. Since a person can be subject to both criminal and civil penalties if convicted of retail theft, a person charged with shoplifting should quickly call 801.618.1333 to speak to a Salt Lake City criminal defense attorney. A defense attorney will be able to tell some charged with retail theft how to best defend against the case and avoid paying civil penalties.